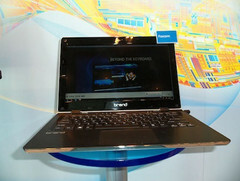 Foxconn showed off a 13.3inch Ultrabook reference which is yet to be named at IDF 2011 in San Francisco. This model is compatible with both 3G as well as 4G mobile broadband services as a SIM card slot is provided. The model looks quite impressive with a brushed aluminium finish with a dark keyboard and dark metallic finish. The 13inch screen provides a 1366 x 768pixels of display. Till no specification has been mentioned but what we can see from the outside says it contains three USB 3.0 ports, an HDMI port, an audio jack and a Wi-Fi on/off switch. This model also seems to be a bit heavy as compared to some other Ultrabooks. Though nothing is said about this next generation device but it may be on the markets by the first quarter of 2012.